Eugène Dubois, a Dutch army doctor, found 1891 a prehistorical skull remain in Trinil in Java. First he considered it coming from a prehistoric big gibbon monkey and called the species anthropopithecus (what was the latin generic name for chimpanzee); later it was recalled pithecanthropus erectus or homo erectus javanicus. His findings are considered being 1 million years old. Gustav Heinrich Ralph von Koenigswald, a German/Dutch geologist and paleontologist, found in the years 1936-39 more remains of early humans in Sangiran, at the banks of the Solo River in Java, 65 km of Trinil. Sangiran is not far from Solo (Suryakarta); it's an easy bus trip to go there. Until 2011 there were more than 80 fossils of homo erectus found in Sangiran. They cover a timespan of about 1.2 million years, of who the oldest are dated back up to 1.5 million years. Sangiran is therefore the richest foundig place for human fossils on earth. The Sangiran homo erectus fossils show significant differences to the younger ones found near Beijing (Beijing Man). It's supposed, that both populations came in different immigration waves from Africa. About half of all the known ever found hominid fossils were discovered in Sangiran. Beside that stone tools, bone tool, axes and a number of other tools were found in Sangiran. The site was inhabited for the last 1,5 million years and shows a long line of continuous human evolution. The fossils found here document also the evolution of human culture, the evolution of local animals and the ancient environment. That all makes it a key site in the understanding of human evolution generally. Therefore it became the status of a UNESCO World Heritage. 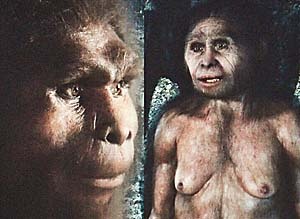 Homo erectus was a pre-human, hominid species which lived some 2 million years ago until around 40,000 years BCE. Homo erectus is supposed to be the missing link between early or pre-humans and modern humans, means homo sapiens and homo neanderthalensis. Homo neanderthalensis was another human evolvement which extinct some 10,000 or 12,000 years ago at the end of the last ice age. There are still scientific disputes about the family tree of homo erectus. Some facts are: this species grew up to 1,80 meters tall, could walk like a modern man (upright walking, erected = 'erectus'), developed controlled handling of fire (some 800,000 years ago), was producing tools and hunting weapons, used first cultural rituals, and was able to speak. Over hundreds of thousands of years hunting techniques became more and more sophisticated, and homo erectus dared to hunt the biggest animals as rhinoceroses, hippopotamuses, elephants, even tigers and other big predators. It seems, that homo erectus was a human who might ate a considerable amount of meat. Might be that the amount of consumed proteins, contained in meat, allowed him to develop a bigger brain. The growing brain, which expanded further at homos sapiens and more at homo neanderthalensis, realized the development from a merely natural being towards a cultural being. Bone relicts of homo eretcus were found in Kenia, Ethiopia, near Beijing and on Java. All the groups of homo erectus came originally from Africa and spread out over the three 'old' continents. At this time, some two million years ago, Java was not an island but connected to the mainland as Sumatra, Borneo and many other Indonesian islands as well (see also: Wallacea and the Wallace Line with a map of the prehistorical land shift of the area). There are no fossils of homo habilis found on Java; habilis was the predecessor of erectus. Traces of homo habilis were exclusively found in east and south Africa. 1.2 million years ago there was an estimated global population of only 55,000 individuals of erectus living in Africa, Europe and Asia. There are irritatingly many different and sometimes mutually excluding theories about homo erectus and his many sidelines over a timespan of almost two million years. As more as it comes into detail as more confusing it gets. Some (or many) of these sidelines extinct, but it's not always clear which sidelines died out and can not be an ancestor of modern man and which sidelines developed to other, more advanced species and later to homo erectus or to homo neanderthalensis or to modern man, homo sapiens. It is also not impossible that some populations of homo erectus survived and mixed up with the archaic, early homo sapiens. It's quite propable that populations of homo erectus still lived when homo sapiens emerged and that both coexisted for a longer period. There are also records of homo floresiensis (the so called 'hobbit'), who lived still at the end of the last ice age on the Indonesian island of Flores, in the same time when homo sapiens made great progress. The difficulties are, first, to date back the fossils accurately, and second, there is still too little evidence found to make up a firm and stable theory which covers the whole pre-human and early-human history. The modern human, homo sapiens, developed in Africa and as well emigrated to Europe, Asia and later to the Americas and Australia. The European homo erectus lived between 800,000 and 40,000 years BC in Spain, France, England and Germany. He developed via homo heidelbergensis to homo neanderthalensis. The 'Toumai' skull of a Sahelanthropus tchadensis was found in 2001 in the Djurab Dessert in northern Chad. It's about six to seven million years old. The brain size is estimated of 340ccm3 to 360ccm3. This very early hominid did not stand and walk upright. The Australopithecus africanus was found in 1924 and called the 'Taung Child' after the name of a village nearby the finding place in South Africa. It's the skull of a three or four years old child which was maybe killed by a bird of prey. It's brain size is given with 405ccm3. These hominides probably walked already upright on two legs. 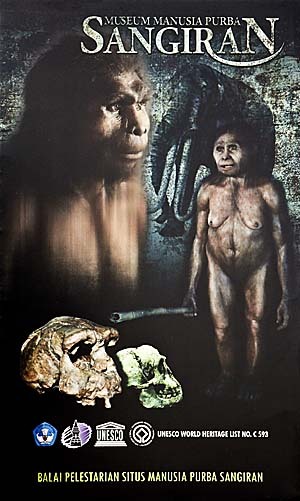 The Homo erectus javanicus has been discovered in 1969 at Sangiran, Java. It's about a million years old and had a brain volume of a liter. The Neanderthal Man is about 50,000 years old and has been found in La Ferracie, France, in 1909. This hominid had a brain volume of 1,750 ccm3 and was larger than modern man. The big nostrils were to warm the breath before inhalating them, because Homo neanderthalensis was adapted to the cold, European climate of the last ice age. Cro-Magnon is already a 'modern' man with a brain volume of about 1,400ccm3. This skull was found in 1998 in the Rhine Valley near Mainz, Germany. At the Sangiran site there is a museum, which was built new in recent months (reopened in December 2011; closed on Mondays). There is a number of human and animal fossils to see. One of the most significant fossils, one of the skulls which Eugène Dubois found, is not here, but in a museum in Bandung. Besides, the new museum houses a remarkable library. The excavation site is a big area around the museum site. There is still much to find, but it costs money. Although the states pour billions over billions in the banking system and the military (about 50% of the worldwide scientists are working at least part-time for military purposes), there is little left for other purposes, e.g. the search of the quest of our existence. 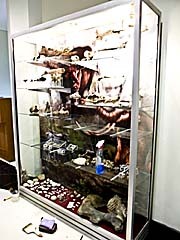 Besides human fossils are a tourist attraction and can be sold. Therefore common people search the site all the time. What they find is usually lost for science.